SME financing, as a consequence of small transaction sizes, entails high transaction costs. Consequently, the banks and other players in the SME space tend to limit post disbursal monitoring. Inadequate monitoring, combined with the intrinsic vulnerability of SMEs or diversion of funds, results in build-up of arrears. The financier often intervenes only once there is delinquency. This belated intervention usually aggravates the problem, the business fails and finally bad debt ensues, ruining the entrepreneur and causing losses for the financier. A major shortcoming of new entrepreneurs is faulty accounting and inadequate understanding of cash flow issues. 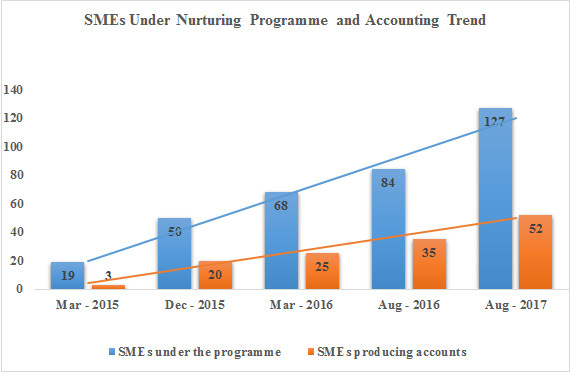 It is proposed that accounting support be offered to SMEs, using the help of external accounting firms who would visit the SMEs as required, to write up the books and report financial position to the SMEs and the monitoring team of the Fund (see below). The program would be monitored by the Head of Finance of the Fund and monitoring action taken based on the feedback from the accounting program. It is expected that this initiative would not only put SMEs on a stronger footing but also reduce the problem of information opacity for the Fund and other financiers. To encourage SMEs to computerize their accounts, standardized accounting software will be sourced and provided at an affordable price to the SMEs. This will enable the Fund to obtain at a minimum, the basic MIS for monitoring. Possibly the single major cause of failure of SMEs and of the lending programs is inadequacy of post lending follow up. This results in diversion of funds, delayed payment, cash flow problems and finally litigation and default. The high level of default, in turn, results in funding drying up for the entire sector. To solve this issue, it is proposed that, each new account be monitored monthly. The monitoring effort would be calibrated based on the reports from the ‘accounting support’ team. To ensure that the monitoring team has a clear understanding of the clients’ business, needs and problems, the function would report to the Marketing Manager. The monitoring team and managerial support for the same would be funded by the offset grant. To support the SME clients, a ‘mentoring’ process will be set up in due course. This is intended to be staffed by volunteer senior managers from the private and public sectors. Prima facie, a mentor would act as mentor to a number of SMEs selected for geographic proximity or sector similarity. The mentors would guide their ‘mentee’ SMEs, sharing experience and helping the mentees address challenges faced and to grow and succeed in business. It is also expected that the mentors will use their contacts and experience to assist the mentees to improve their market access. Expenses for the mentoring initiative would be relatively limited and would be met from the offset grant. Given the complexity of the effort, it would be launched once other operations stabilize.